If you are looking for a quiet neighborhood, just outside the city limits, Woodbury at Palmetto Pointe is calling your name. Built by D.R. Horton in 2010, in Socastee, this beautiful community offers 2 to 5-bedroom homes with so many upgrades you’ll feel the king or queen of your very own castle. Things like 2-car garages, screened porches, granite counter tops, crown molding, and wood burning fireplaces were either original or added later. Underground utilities and beautifully manicured streets, sidewalks, a clubhouse, and community pool that are covered by HOA fees of less than $100, are part of the appeal of this picturesque community. The large community pond offers scenic water views. Outside the city limits, just of Hwy 17, property taxes are lower. Students attend Lakewood Elementary School, Forestbrook Middle School, and Socastee High School. Just off Hwy 17, near Hwy 544, this is an ideal location. Close by you will find an abundance of restaurants and all the fun things to do along the Grand Strand. Surfside Beach, Coastal Grand Mall, Market Common, and the airport are just a short drive down the road. To learn more about this fantastic community, please visit our website. Call our real estate experts with any questions you may have and be sure to schedule a private tour of the homes for sale in Woodbury at Palmetto Pointe to see all this neighborhood has to offer. Idyllic temperatures year-round and an unlimited supply of entertainment, attractions, shopping, and dining options are just some of the reasons why tourists flock to beautiful Myrtle Beach every year. Surrounded by picturesque beaches and championship golf courses, many visitors decide to stay. Since 2015, the new home market in North Myrtle Beach, Myrtle Beach and the Murrells Inlet area has been booming. New homes by nationally recognized builders like Lennar, Centex, Pulte Homes, and DR Horton, as well as prize-winning regional favorites and local companies, are springing up all along the Grand Strand. 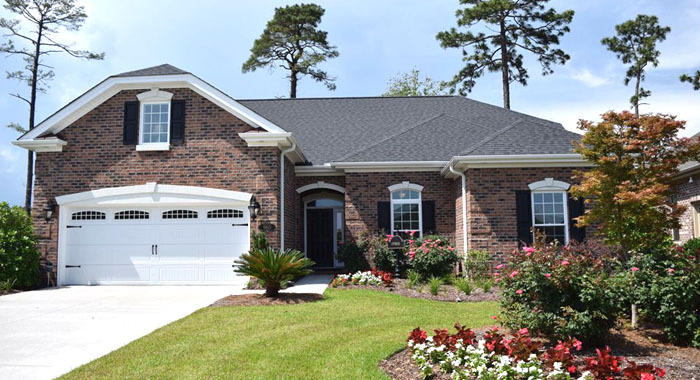 Whatever you are looking for, from golf course homes to beach houses to townhomes to houses along the Intracoastal Waterway, there is a new home waiting for you in Myrtle Beach. Budget-friendly houses priced around $150,000 to elegant mansions that cost $1 million or more, in every location, style, and size, guarantee you will find the perfect home to fit your needs. The 55+ communities that cater to active older adults offer patio homes and feature many activities and social events. Buying new home options not available when buying a previously owned home. New constructions have higher standards and are more energy efficient. A new home has lower maintenance and a 10-year warranty. If you are involved in the building of the home, you can choose color schemes and options that fit your lifestyle and give you peace of mind. There are distinct advantages to working with us to buy your new home. You can get a 1% Cash Back Rebate courtesy of the Exclusive Myrtle Beach Rebate program. We can negotiate with developers for upgrades and additions to make sure you get the best deals We have Contract Construction Consultants that will write you contract the right way which can save you thousands. Visit our website to see some of the available listings. Call our real estate professionals with any questions you might have. Schedule a private tour of Myrtle Beach new homes and let us show you all the beautiful homes just waiting for a loving family to move in.